Hotwash waterfed pole trolley system in the world. Now you can work in freezing conditions. Hotwash Water Fed Pole Window Cleaning, cleans better with less spotting, work when others can't, work faster, now you don't have to start later when the temprature rises, and days off in icy conditions. Impress your customers with steam rising from your brush. Hot water cleaning is better than cold, Why not try a hotwash pole cleaning system now? The best value water fed pole window cleaning equipment on the market. Trolley equipment and tools for Professional Window Cleaners. 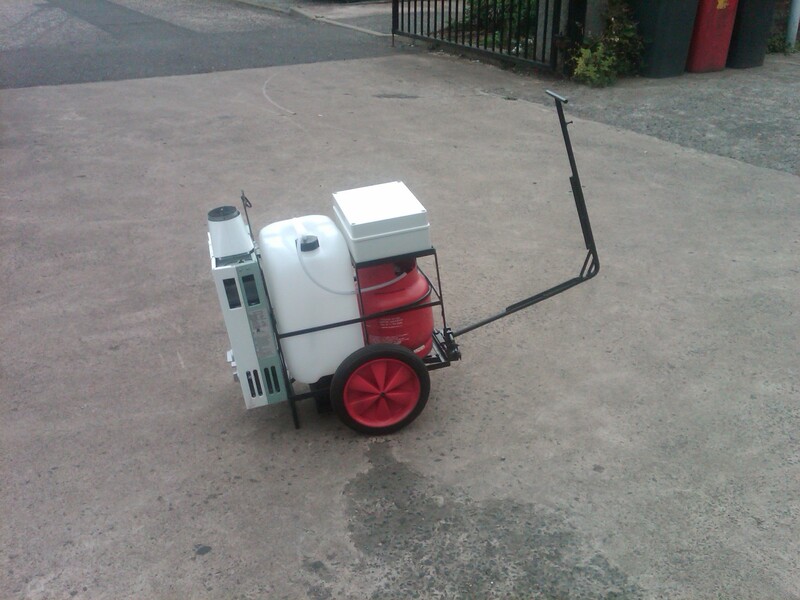 Water Fed Pole equipment does not get any better than this, the only hotwash cleaning trolley system on the market. All the parts you see on the trolley slide off in seconds. No need to be lifting heavy weights around all day as one or two 25L containers can be slotted in when needed. Although most of the time one 25L container is enough, it is very handy to be able to use two when needed. Other waterfed pole trolley systems have you lifting 60 litres of water at a time. This pole window cleaning equipment is being used sucsessfuly by window cleaners from around the world. It works well. Battery Pack lasts all day and takes around 6 hours to charge. It produces 200gpd (757L) of pure water per day. 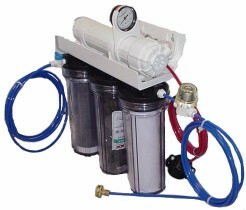 This RO filtration system comes ready to connect to your tap. It has a pressure gauge and dual TDS meter already fitted. The system is being monitored all the way through. It runs off mains water pressure so no need for an electrical supply. 4 Stage water filtration for hard water areas. For a limited time only you can upgrade to the 300gpd RO system for only £60.00 + VAT extra. This Trolley water fed pole system cost thousands of pounds less than the competitors Van Mount systems. Click here to find unbelievable prices on our Van mount window cleaning systems. By buying you waterfed pole system from us you will be assuring yourself you will be getting the very latest in window cleaning technology. Take the new Autobrush for example, these brushes invented by us are exclusive to the Auatec systems. You may not appreciate the value of the Autobrush if you are not yet already a water fed pole user, but with a licence from Aquatec in the near future all window cleaning brushes will come fitted with the Autobrush mechanism as standard. Behind the scene we are already working on the very latest technology and Aquatec customers will be the first to find out about it, and have the option of adding this technology to their waterfed pole system at discounted prices. Not to be confused with the USA L5 water heater wich has no CE certification for use in the UK. Please visit my waterfed pole Blogg.